The Standing Stone features information, pictures and discussion about historical sites in Ireland with a focus on the midland region. Ranging from megalithic tombs to 17th century fortified houses you will find a variety of interesting places. Here you will see an Ireland that you will not find in the guide books. Most sites covered here are largely unknown and largely off-road! I cover only places that I have personally visited and therefore can give detailed information about the difficulty of seeing a particular site and things to be aware of. I hope you enjoy this site and please feel free to leave comments and feel free to contact me with any questions and suggestions. The goal of this site is to eventually represent the whole country. Initially this site began with sites in Laois and Tipperary only but has now expanded to include Offaly, Carlow, Limerick, Kildare, Roscommon Sligo, and more recently Clare, Meath, Antrim, Dublin, and Wicklow. If there is a site you would like me to cover please feel free to contact me. This site is always expanding as I visit more sites so please check back again...if I have left out a major site, rest assured that it will eventually find its way on here. 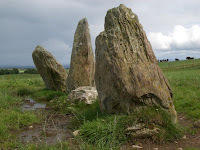 This site is more about the lesser known sites in Ireland. I try to add as much stuff as possible but sometimes life gets in the way. Updates are never far away. News and visit blog has been updated on Sunday 25th November, 2018...click here. The Standing Stone now has 416 sites and 3335 photographs...and counting.